Medieval literature is a broad subject, encompassing essentially all written works available in Europe and beyond during the Middle Ages (that is, the one thousand years from the fall of the Western Roman Empire ca. AD 500 to the beginning of the Florentine Renaissance in the late 15th century). The literature of this time was composed of religious writings as well as secular works. Just as in modern literature, it is a complex and rich field of study, from the utterly sacred to the exuberantly profane, touching all points in-between. Works of literature are often grouped by place of origin, language, and genre. The common people continued to use their respective vernaculars. A few examples, such as the Old English Beowulf, the Middle High German Nibelungenlied, the Medieval Greek Digenis Acritas, the Old East Slavic Tale of Igor's Campaign, and the Old French Chanson de Roland, are well known to this day. Although the extant versions of these epics are generally considered the works of individual (but anonymous) poets, there is no doubt that they are based on their peoples' older oral traditions. Celtic traditions have survived in the lais of Marie de France, the Mabinogion and the Arthurian cycles. Another host of vernacular literature has survived in the Old Norse literature and more specifically in the Saga literature of Iceland. A notable amount of medieval literature is anonymous. This is not only due to the lack of documents from a period, but also due to an interpretation of the author's role that differs considerably from the romantic interpretation of the term in use today. Medieval authors often deeply respected the classical writers and the Church Fathers and tended to re-tell and embellish stories they had heard or read rather than invent new stories. And even when they did, they often claimed to be handing down something from an auctor instead. From this point of view, the names of the individual authors seemed much less important, and therefore many important works were never attributed to any specific person. Theological works were the dominant form of literature typically found in libraries during the Middle Ages. Catholic clerics were the intellectual center of society in the Middle Ages, and it is their literature that was produced in the greatest quantity. Countless hymns survive from this time period (both liturgical and paraliturgical). The liturgy itself was not in fixed form, and numerous competing missals set out individual conceptions of the order of the mass. Religious scholars such as Anselm of Canterbury, Thomas Aquinas, and Pierre Abélard wrote lengthy theological and philosophical treatises, often attempting to reconcile the teachings of the Greek and Roman pagan authors with the doctrines of the Church. Hagiographies, or "lives of the saints", were also frequently written, as an encouragement to the devout and a warning to others. The Golden Legend of Jacobus de Voragine reached such popularity that, in its time, it was reportedly read more often than the Bible. Francis of Assisi was a prolific poet, and his Franciscan followers frequently wrote poetry themselves as an expression of their piety. Dies Irae and Stabat Mater are two of the most powerful Latin poems on religious subjects. Goliardic poetry (four-line stanzas of satiric verse) was an art form used by some clerics to express dissent. The only widespread religious writing that was not produced by clerics were the mystery plays: growing out of simple tableaux re-enactments of a single Biblical scene, each mystery play became its village's expression of the key events in the Bible. The text of these plays was often controlled by local guilds, and mystery plays would be performed regularly on set feast-days, often lasting all day long and into the night. 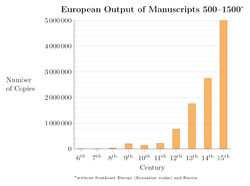 During the Middle Ages, the Jewish population of Europe also produced a number of outstanding writers. Maimonides, born in Cordoba, Spain, and Rashi, born in Troyes, France, are two of the best-known and most influential of these Jewish authors. Secular literature in this period was not produced in equal quantity as religious literature. 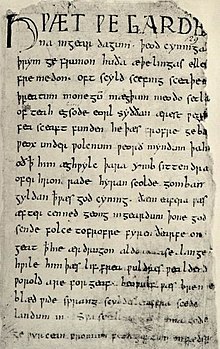 The earliest tales are based on oral traditions: the British Y Goddoddin and Preiddeu Annwfn, along with the Germanic Beowulf and Nibelungenlied. They relate to myths or certain 6th-century events, but the surviving manuscripts date from centuries later—Y Goddoddin from the late 13th century, Preiddu Annwfn from the early 14th century, Beowulf from c. 1000, and the Nibelungenlied from the 13th century. The makers and performers were bards (British/Welsh) and scops (Germanic), elite professionals attached to royal or noble courts to praise the heroes of legendary history. Prose tales first emerged in Britain: the intricate Mabinogi quartet about princely families, notably anti-war in theme, and the romantic adventure Culhwch and Olwen, famous for the earliest mention of King Arthur. (The Mabinogi is not the same as the Mabinogion, a collection of disconnected prose tales, which does, however, include both the Mabinogi and Culhwch and Olwen.) These works were compiled from earlier oral tradition c. 1100. At about the same time a new poetry of "courtly love" became fashionable in Europe. Traveling singers—troubadours and trouvères—made a living from their love songs in French, Spanish, Galician-Portuguese, Catalan, Provençal, and Greek. Germanic culture had its Minnesänger tradition. The songs of courtly love often express unrequited longing for an ideal woman, but there are also aubades (dawn farewells by lovers) and humorous ditties. Following the earliest epic poems, prose tales, and romances, more long poems were crafted—the chansons de geste of the late 11th and early 12th centuries. These extolled conquests, as in The Song of Roland (part of the Matter of France) and Digenis Acritas (one of the Acritic songs). The rather different chivalric romance tradition concerns adventures about marvels, love, and chivalry. They tell of the Matter of Britain and the Matter of Rome. Political poetry threads throughout the period from the very early Armes Prydein (10th-century Britain) to the goliard rebels of 12th and 13th centuries, who were church trained clerics unable or unwilling to be employed in the church. Travel literature was highly popular in the Middle Ages, as fantastic accounts of far-off lands (frequently embellished or entirely false) entertained a society that supported sea voyages and trading along coasts and rivers, as well as pilgrimages to such destinations as Jerusalem; Canterbury and Glastonbury in England; St. David's in Wales; and Santiago de Compostela in Spain. Geoffrey Chaucer's Canterbury Tales became popular at the end of the 14th century. The most prominent authors of Jewish secular poetry in the Middle Ages were Solomon ibn Gabirol and Yehuda Halevi, both of whom were also renowned religious poets. While it is true that women in the medieval period were never accorded full equality with men, some women were able to use their skill with the written word to gain renown. Religious writing was the easiest avenue—women who would later be canonized as saints frequently published their reflections, revelations, and prayers. Much of what is known about women in the Middle Ages is known from the works of nuns such as Clare of Assisi, Bridget of Sweden, and Catherine of Siena. Frequently, however, the religious perspectives of women were held to be unorthodox by those in power, and the mystical visions of such authors as Julian of Norwich, Mechthild of Magdeburg, and Hildegard of Bingen provide insight into a part of the medieval experience less comfortable for the institutions that ruled Europe at the time. Women wrote influential texts in the secular realm as well—reflections on courtly love and society by Marie de France and Christine de Pizan continue to be studied for their glimpses of medieval society. While medieval literature makes use of many literary devices, allegory is so prominent in this period as to deserve special mention. Much of medieval literature relied on allegory to convey the morals the author had in mind while writing—representations of abstract qualities, events, and institutions are thick in much of the literature of this time. Probably the earliest and most influential allegory is the Psychomachia (Battle of Souls) by Aurelius Clemens Prudentius. Other important examples include the Romance of the Rose, Everyman, Piers Plowman, Roman de Fauvel, and The Divine Comedy. Dukus Horant, the first extended work in Yiddish. ^ McDonald, Nicola. " Women Readers in the Middle Ages (review)"